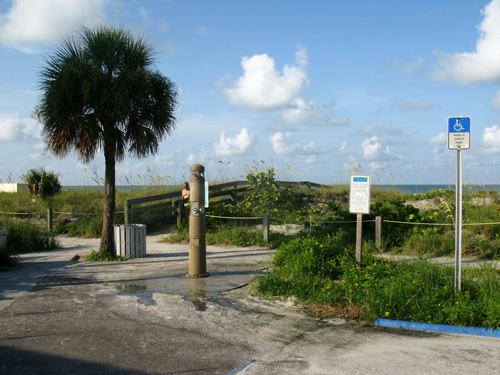 Archibald Park Beach is located where Madeira Way deadends into Gulf Blvd on Madeira Beach. 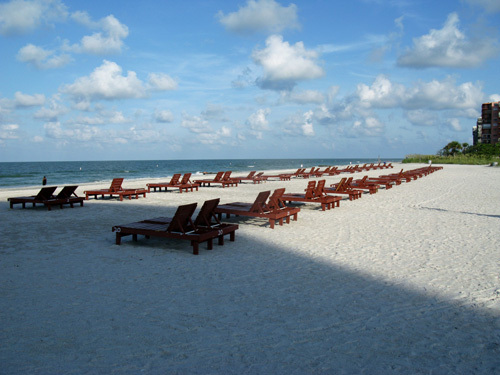 Named for early developer Albert Archibald, it is a popular Florida beach with sugary white sand. 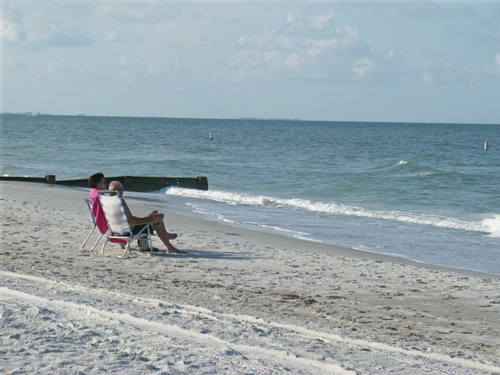 Madeira Beach FL is one of the most laid-back communities on the Florida Gulf Beaches. Archibald Memorial Beach Park is sandwiched between two tall condo complexes at about 153rd Avenue on Gulf Blvd. It is easily recognized by the huge log cabin structure which has been the center of controversy for about 20 years in this little city. 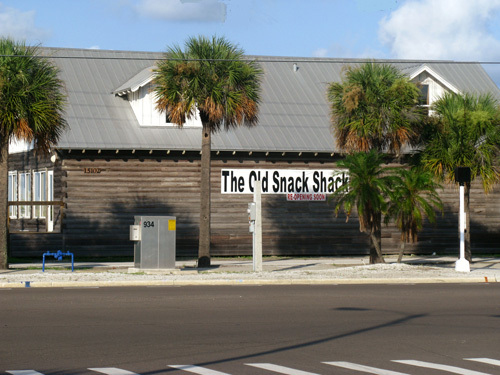 Formally, this was the site of the iconic "Snack Shack" that provided inexpensive food for beach goers back in the 1970's. Now, 40 years later (2010), it looks like it may once again regain its rightful place in the lore of Madeira Beach. 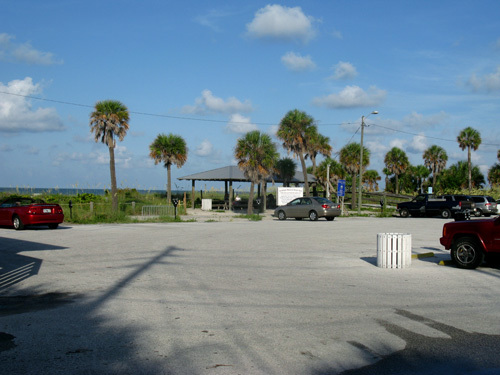 This beach park has a nice covered picnic area that is used for everything from Brownie Troop gatherings to morning AA meetings. It is kind of tough to see the beach, though because it is behind a dune. There are four wooden walkovers, an outside shower area, and large public restrooms. 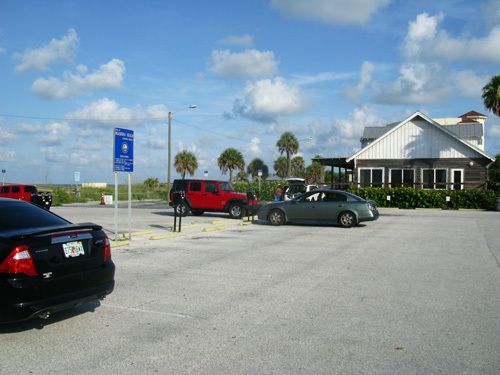 Parking lots are on both the north and south ends of the Snack Shack. Make sure you bring plenty of quarters. The cost is one hour for $1.00. 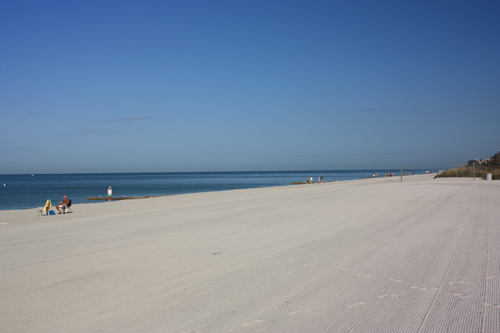 Archibald Memorial Beach Park provides tranquil mornings. It does not get very crowded with families until about 11:00am. John Ash, a retired Post Office carrier, from North Carolina said, "I really like it out here on spring mornings. 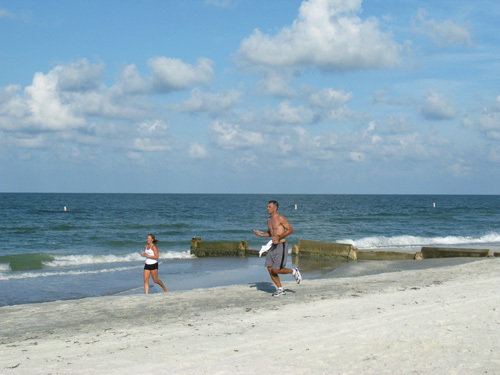 I walk or run on the beach about 8:00am, get a shower up by the Snack Shack, then read for a couple of hours. When Madeira Beach starts waking up near noon, I'm already heading back home. It is just so peaceful out here in the morning. The city tractor does a wonderful job of making the sand look like a carpet. It starts my whole day off right." You can't miss the huge log cabin right across from the Subway shop on Madeira Way. There is a large parking lot on the north side. The covered picnic pavilion is located on this end. There is a slightly smaller parking lot on the south side of The Snack Shack. 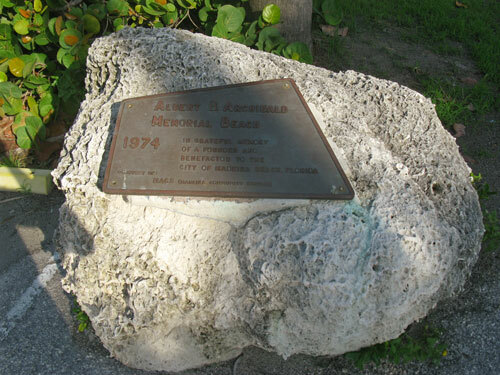 It is here in the south parking lot that a bronze plaque next to The Snack Shack honors Albert Archibald who spearheaded the development of Madeira bBeach in the 1920's. 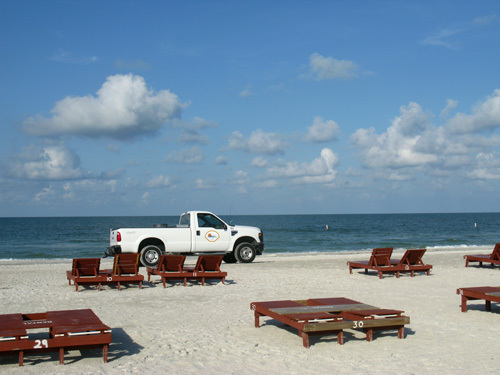 There are several wooden walkovers to take you down to the beautiful white sugar sand beach. This park also has a shower and restroom facilities. Concrete groins, spaced about 100' apart line Archibald Memorial Park Beach. Be watchful at high tide. Older visitors enjoy the quiet mornings when all you can hear is the surf coming in and a few cries from lonely gulls. Younger locals and visitors enjoy the solitude, but a more active morning here in Paradise. 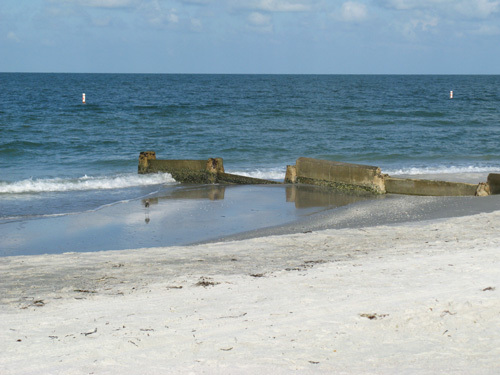 Archibald Park Beach is kept beautiful by The City of Madeira Beach. 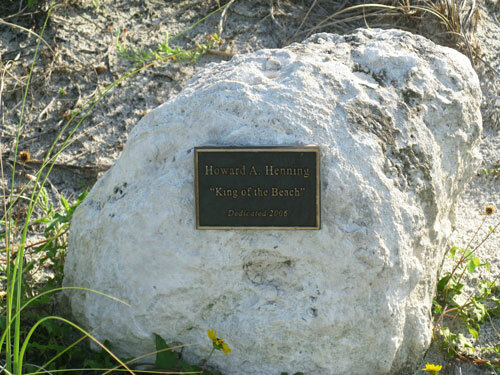 A small memorial, hidden among the low dunes, honors longtime resident, Howard Henning, who, along with his girlfriend, Jane, ran the beach chair rentals here at Archibald Park. He passed away in May, 2006. It was shock to all of us. You could not meet a more gracious guy. 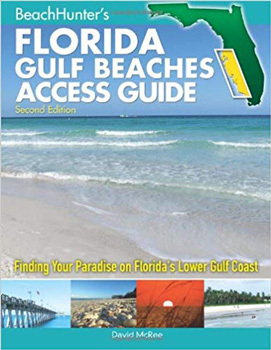 Archibald Park Beach is a nice place to unwind on a Florida beaches vacation. It is relatively uncrowded during the early hours during the week. However, this beach is a favorite of families on the weekends. It can get a bit packed on Saturdays and Sundays.